This DNA Paternity test gives you an accurate determination (with 99% or more certainty) of who the child’s biological father is. 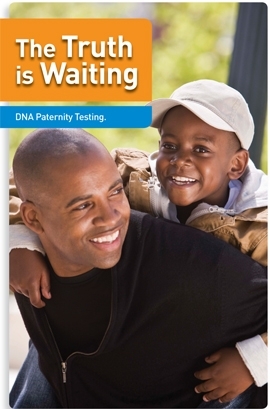 To determine the biological father of your child get this Basic DNA Paternity Test. This test is for informational purposes only and not admissible in court or for legal evidence that may be needed for documentation. We all inherit our DNA from our biological parents — half from our mother, and half from our father. A DNA paternity test compares a child’s DNA pattern with that of an “alleged father” to determine if there is a match. When performed correctly in an experienced laboratory, it’s the most definitive proof of a biological relationship. We make the process for you very simple and easy. It starts by taking saliva samples to obtain DNA from the child and the alleged father. A sample from the mother is NOT required, but can be useful. An analysis of the child and mom’s DNA can be used to help pinpoint the exact “genetic markers” that came from the father. Then the DNA of the potential father is analyzed to determine the probability that his genetic markers are found in the child. This is known as a percentage of probability of paternity. NOTE: Informational Paternity Test is not admissible in court. If you need the results to be admissible in court, click here for Legally-Admissible Paternity Test. Our professional medical assistant will rub a few swabs on the inside of both cheeks of the child and possible father to determine the paternity of a single child. If more than one child is being tested or if there is more than one alleged father, additional fees will be incurred. If you have a specimen with DNA on it, please ask the sales associate if we are able to do the test on your specimen and for additional pricing. 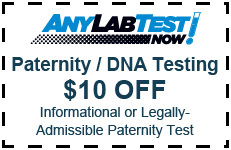 NOTE: The Basic DNA Paternity Test is not admissible in court. Names of the tested parties will not be shown on the test results. If you need the results to be admissible in court, ask about our Chain of Custody (Legally Admissible) Paternity Test. Our DNA test providers are accredited by leading institutions.